Metz is a city in the northeast of France, Le Grand Est, capital of the Lorraine region, and one that I had never visited before last weekend. 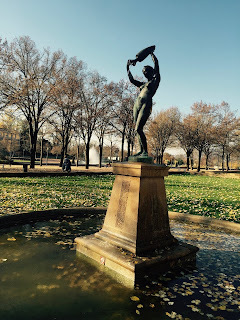 It sits alongside the winding Moselle river and is surprisingly inspiring. 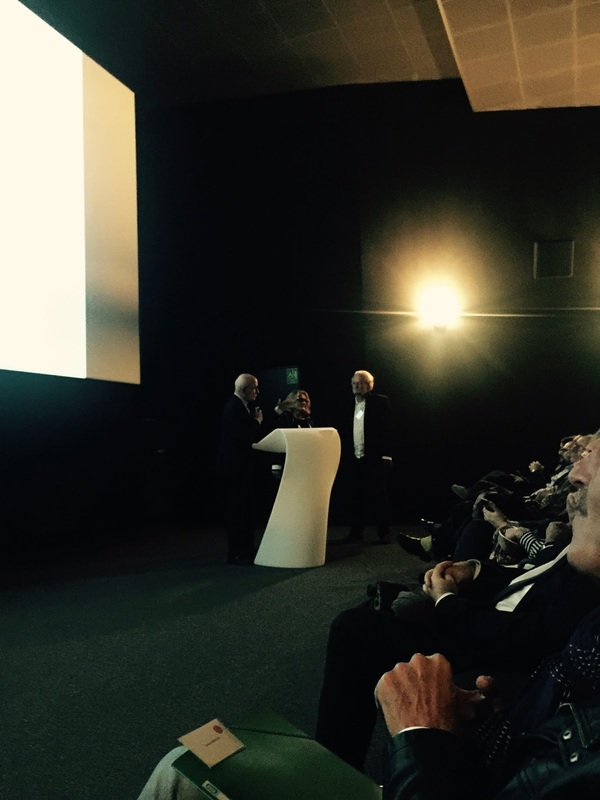 I was in town because my husband, Michel Noll, was inaugurating a film festival. 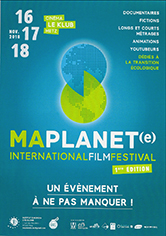 The festival, titled Ma Planete, is dedicated entirely to films which, from one aspect or another, are concerned with the environment. 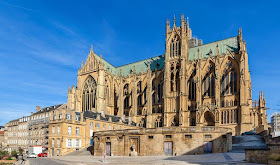 Why Metz? I had asked him. Jean-Marie Pelt, was his answer. Michel worked with Professor Pelt on a television series, Les Aventures des Plantes. They were in the early stages of a follow-up series when Pelt died. This festival, Ma Planete, is in its way a continuation of the work Michel and Pelt were collaborating on. It is also a homage to his brilliant and much-missed colleague. 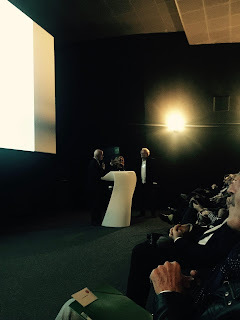 The opening night of the Ma Planete Festival. Michel Noll, co-founder and artistic director, is right of image. The auditorium holds 250 spectators and it was packed to the rafters. 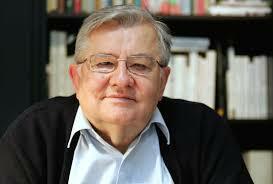 Along with Simone Weil, Jacques Delors and other leading figures, Pelt was a prominent member of the Committee of 21. They were committed to implementing Agenda 21 which was a product of the Earth Summit held in Brazil in 1992. Agenda 21's aim is to achieve global sustainable development for the 21st century, for the planet. One of Agenda 21's objectives is that every local government should draw up its own plans and goals, its own understanding of urban ecology. People living and working together and keeping the carbon footprint light. Walking round the small city of Metz during these those few days I was taken by its evident commitment to the ideals of Pelt. His philosophy of urban ecology, which, broadly speaking includes that scientists, scholars of all disciplines should be working in collaboration with decision makers. Urban ecology is growing as a field that integrates social, biophysical and engineering sciences. It links directly into practices such as urban planning and urban design. Cities do and must play an increasingly important role in each of the three main pillars of sustainability: social, economic and environmental and their impacts need to reach far beyond their boundaries. 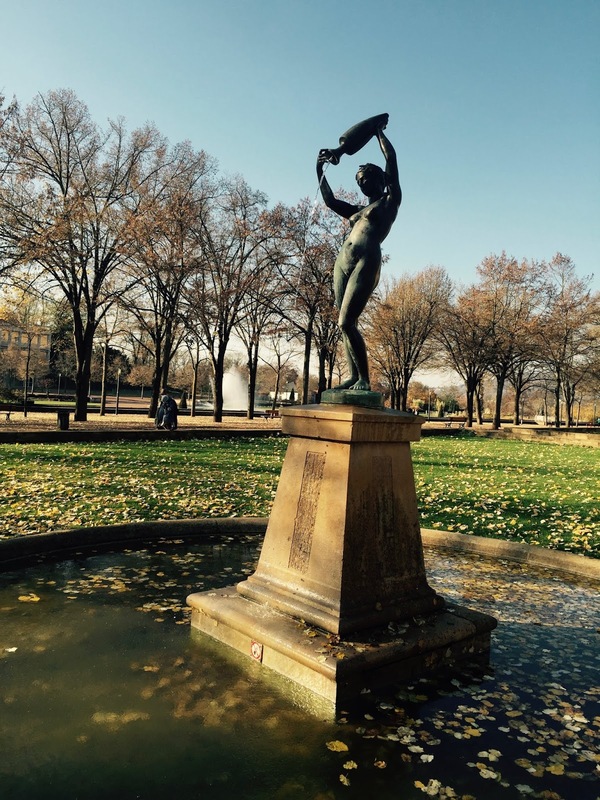 Thanks to Pelt, Metz boasts that it is the birthplace of urban ecology. The city also claims that there is 45 square metres of green space for each inhabitant. The city centre is pedestrian - its tram and bus services are exemplary. You can get anywhere without traffic jams, without congestion, both swiftly and economically. Steps away from the many cafés and shops is the river. The banks of the Moselle offer walks, places to sit and reflect, opportunities to picnic, congregate, read beneath the shade of trees, river cruises. The old city also offers gems to visit too. Saint Stephen's Cathedral is a gothic splendour. Its stained glass windows constitute the largest expanse of ancient stained glass in any single building in the world and for that reason the cathedral is known as the "Good Lord's Lantern". These windows stop you in your tracks. It was a cold bright Sunday morning when I ventured inside the cathedral. The sun was shining through in a rainbow of brilliant colours offering radiance, light and warmth to the lofty austere interior. The earliest of the stained glass was made by the master craftsman Herman von Munster in the fourteenth century. Later, in the sixteenth, Valentin Bousch signed his skills. Between 1958 and 1968, nineteen windows were designed by Marc Chagall. They are a must see. 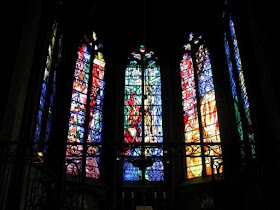 Chagall also designed stained glass windows for the Cathedral of Reims. If you are travelling in northeastern France, I really urge to visit both. There are sections of the glass that still require work and I read that the artists Roger Bissière and Jacques Villon (pseudonym of Gaston Duchamp, brother of Marcel Duchamp) had both provided further sets of designs. 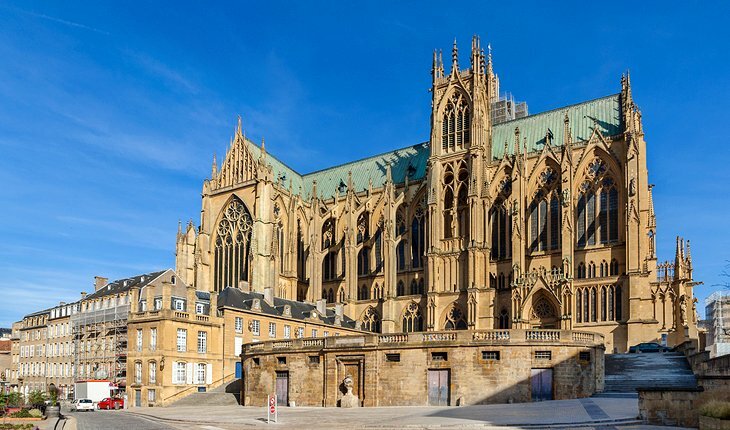 The cathedral and many of the city's most impressive buildings are built with yellow Jaumont stone. Pierre de Jaumont is a sand/lime stone, 175 million years old, from the commune of Montois-la-Montagne, in Lorraine. I will return soon. There are exquisite churches to explore as well as a recently-opened Centre Pompidou, which is a short bus ride beyond the city's centre. 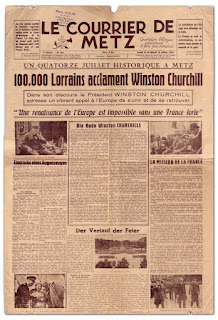 British Prime Minister Winston Churchill visited Metz in 1946. 14th July 1946. The first liberated Quatorze Juillet post WWII. Churchill began his speech by saying: "Take warning, I am going to speak to you in French," which he did. 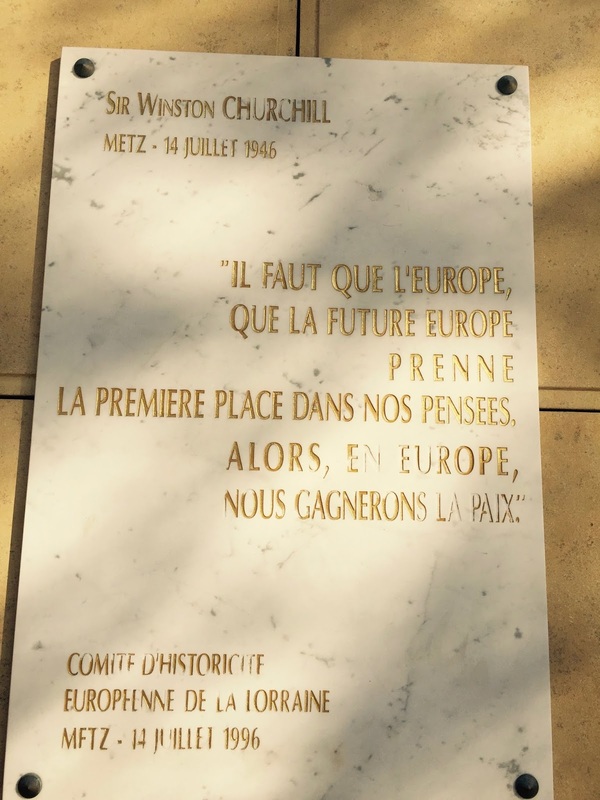 He went on to speak of the dream of a united, peaceful Europe. He stressed the importance of uniting Europe in this post-war period, urging France to take the initiative in order to advance Franco-German relations and peace within Europe. It pre-dated his famous September 1946 speech made at Zurich University when he finished with the words" "Let Europe arise!" 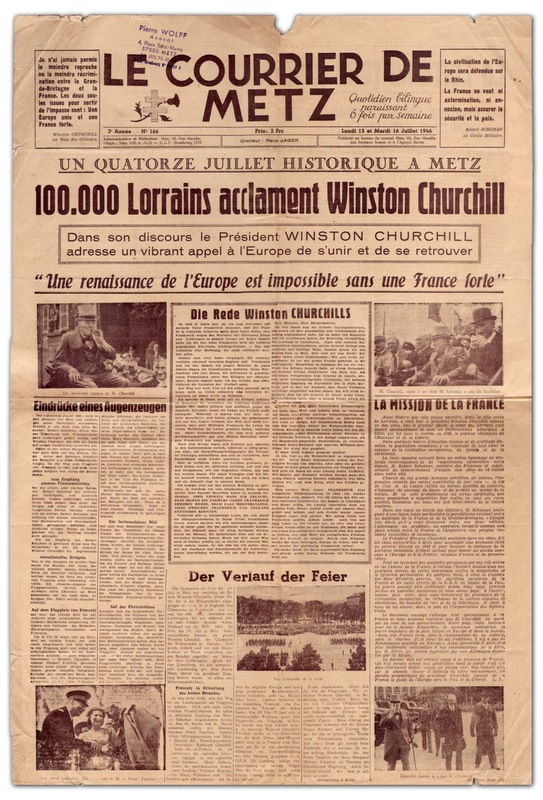 On 15 July 1946, the front page of the French daily newspaper Le Courrier de Metz illustrates the historic visit of British Prime Minister Winston Churchill to Metz and emphasises the importance of his speech in favour of European unity. Do take a look at this marvellous short video of his visit. You can see the local costumes and the attractive sandstone buildings as well as the cathedral. This little film captures a corner of France celebrating victory, looking to its future. Metz has been under German or French control at different times in its history. The frontier has been re-delianated on several occasions. Today, it is French and it is proudly European, forward-looking and is committed to a safer, cleaner world, to responsible urban living. As always you take me, the reader (especially the American reader), to places I probably never will be able to see. I so enjoy your books and have probably read the non fiction ones six or seven times each. Thank you for sharing your world, journeys, celebrations and thoughts.